I joined more than 300 people in the ballroom of the Drake Hotel in Chicago to celebrate Milton Friedman’s 100th birthday on Tuesday evening, July 31. I attended the dinner, sponsored by the Friedman Foundation for Educational Choice, because “Milton,” as I called him, meant so much to me during the 20 years that I knew him. 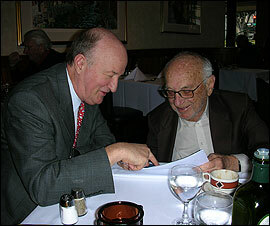 In fact, I perhaps was the last person to have lunch with him in 2006, only a few weeks before he died. He told me that he admired my book “The Making of Modern Economics.” He once said, “All histories of [economic] thought are BS — Before Skousen.” Not bad! 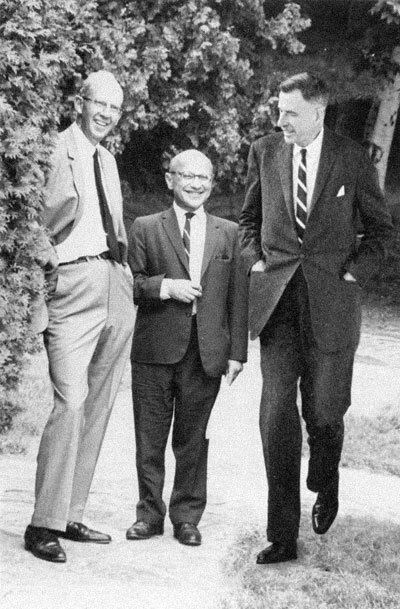 I had a lot of fun at the dinner earlier this week when I circulated the photo below of Milton Friedman, along with George Stigler, his academic sidekick at University of Chicago, and John Kenneth Galbraith. Rarely do we celebrate the lives of famous people years after they die. But Milton Friedman was a role model for how to get things done and how to change the world. The Economist magazine called him the most influential economist of the second half of the 20th century. He also certainly was a most serious opponent to Keynes and big government. His major book, “A Monetary History of the United States,” co-authored with Anna Schwartz (who died a few months ago), changed the way economists and historians view the Great Depression. Because of Friedman’s meticulous research, the biggest economic catastrophe in American history is now viewed as a failure of government policy, not due to the pursuit of free enterprise. Robert Enlow, president of the Friedman Foundation for Educational Choice, shared a story about how Friedman’s influence continues to this day. Friedman and his wife decided in the late 1990s to focus on school choice (vouchers), a winnable line of action compared to, say, privatizing all the schools, going back to the gold standard, or abolishing the income tax. Friedman was famous for advocating “second-best” solutions, such as the flat tax, privatizing Social Security, and the negative income tax as an alternative to the welfare system. Exclusive Which Is Better, Value or Growth Investing? Enlow recalled the remarkable advances made in state after state on the school choice issue. He pointed out that 18 states now offer some form of school choice. In the audience were quite a few people who were spearheading the school choice program in various states. Many of those school choice advocates were black Americans. For more information about school choice, go to http://www.edchoice.org/. The keynote speaker at the dinner this week was Condoleezza Rice, former Secretary of State under the administration of President George W. Bush. She praised Friedman for helping to “change the course of history” and boldly declared, “School choice is a civil rights issue.” She said she was inspired by Milton and Rose Friedman and their “simple idea that free markets and free people will rule the world.” Rice recalled the history of the post-World War II era, from the deep pessimism of the cold war period to the optimism that emerged from the collapse of the Soviet Union. But Rice wisely avoided discussing the more recent contentious times of the Bush Doctrine (Iraq and Afghanistan wars), the huge deficits, and “No Child Left Behind” legislation, all of which the Friedmans opposed. I tell this story and several others, including the time I ripped up Milton Friedman’s $20 bill, in this tribute on my personal website. “Republicans defy basic math by arguing that you can cut deficits by throwing public employees out of work, which cuts the number of taxpayers (and hence reduces tax revenue)…,” Professor Westen asserted. Prof. Westen may be good at math, but not accounting. The entire salary of all public employees comes from taxes; they just give some of it back in the form of withholding. His calculations include the loss of tax revenue when you end withholding of these fired public workers, but he forgets the other side of the ledger, the savings in gross taxes from not having to pay the gross salaries of these public workers. On net balance, there is considerable tax savings by laying off public workers. I have written Prof. Westen to share my views, but have not received a reply. There's nothing quite like the sound of a cash register ring -- even if in today's world, it’s more like seeing a number on your computer screen. It makes the ups and downs of the market so much easier to bear -- especially during the Dog Days of Summer. There will be plenty of time for more Bull Market-style gains when the markets heat up as we move into the fourth quarter.